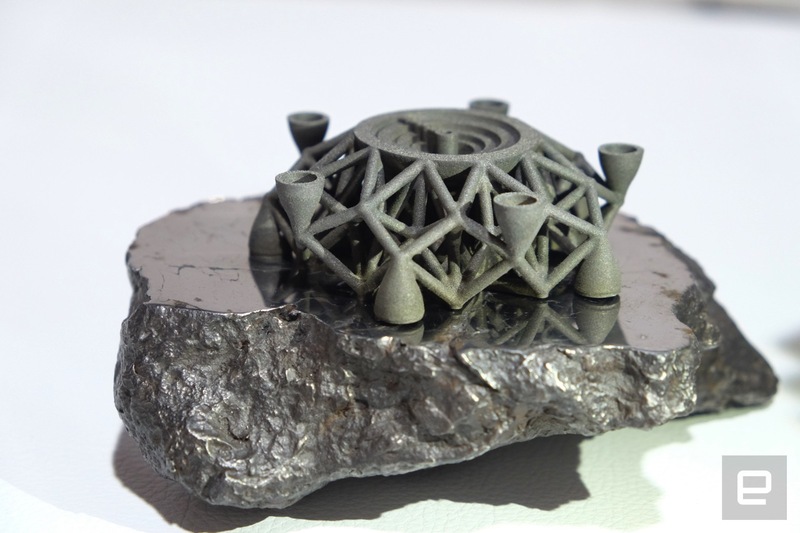 Planetary Resources and 3D Systems turned a meteorite into a 3D print. So-called "asteroid mining" company Planetary Resources is built on the belief that asteroids and other objects in space are loaded with resources that we can take advantage of, both here on Earth and as we begin to explore space in earnest. The essentially infinite supply of rocks floating through space, filled with valuable minerals that we'll eventually run out of on our home planet, sounds like a great resource to take advantage of. But the idea of mining, processing and building with alien metals also sounds like a massive and daunting undertaking. But today Planetary Resources is showing that it can do the last item on that list: building with metals not from Earth. At its booth at CES this year, the company is showing off a 3D-printed part that was made from a material not of this planet. Specifically, the company took material from a meteorite that landed in Argentina in prehistoric times, processed it and fed it through the new 3D Systems ProX DMP 320 direct metal printer. The result is a small 3D-printed model of a part of a spacecraft that resembles the Arkyd spacecraft that Planetary Resources is testing. It's not spectacular in a vacuum -- but the fact that Planetary Resources and 3D Systems were able to successfully make a print using meteorite material is an important first step toward realizing the company's vision. If we're ever going to explore space in any significant fashion and really move beyond Earth, Planetary Resources CEO Chris Lewicki believes we'll need to figure out how to build and manufacture in space. "Instead of manufacturing something in an Earth factory and putting it on a rocket and shipping it to space," Lewicki mused, "what if we put a 3D printer into space and everything we printed with it we got from space?" That would mean Planetary Resources would have to get really good at both mining raw materials from space and converting them into a state that we'd be able to use for manufacturing items away from our home planet. "There are billions and billions of tons of this material in space," Lewicki said. "Everyone has probably seen an iron meteorite in a museum, now we have the tech to take that material and print it in a metal printer using high energy laser. Imagine if we could do that in space." Transforming a chunk of space rock into something you can feed into a 3D printer is a pretty odd process. 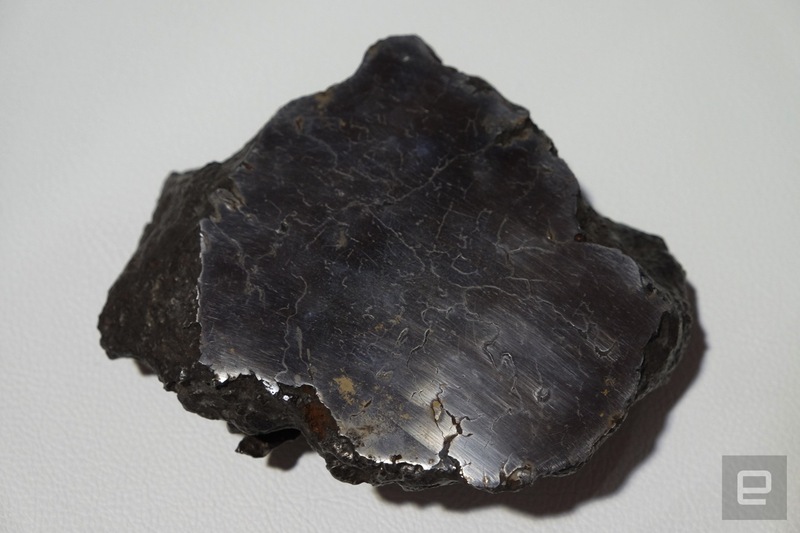 Planetary Resources uses a plasma that essentially turns the meteorite into a cloud that then "precipitates" metallic powder that can be extracted via a vacuum system. "It condenses like rain out of a cloud," said Lewicki, "but instead of raining water, you're raining titanium pellets out of an iron nickel cloud." Lewicki also noted that extraction could be accomplished with magnets; either way it produces material that lets you start building. But it's pretty crude building at this point, Lewicki cautioned. "We're in the iron age of building in space, quite literally." Though the process for creating the printer's "ink" (as Lewicki has become fond of calling the 3D-printing material) is somewhat unusual, the 3D Systems printer used to make this part is commercially available. Planetary Resources has partnered with 3D Systems since early in the company's founding day, in large part because Lewicki believes that 3D printing will be essential to space exploration. "We knew that one of the key technologies for lowering the cost of exploring space and building things in space was 3D printing," said Lewicki. Of course, to move this forward, the printer will need to work in space, likely in zero-gravity environments, something it isn't equipped for now. "How do you get [the printed object] to stay in place while it's being printed? How do you get the powder to stay in place?" Lewicki asked, noting just a few of the inherent challenges. 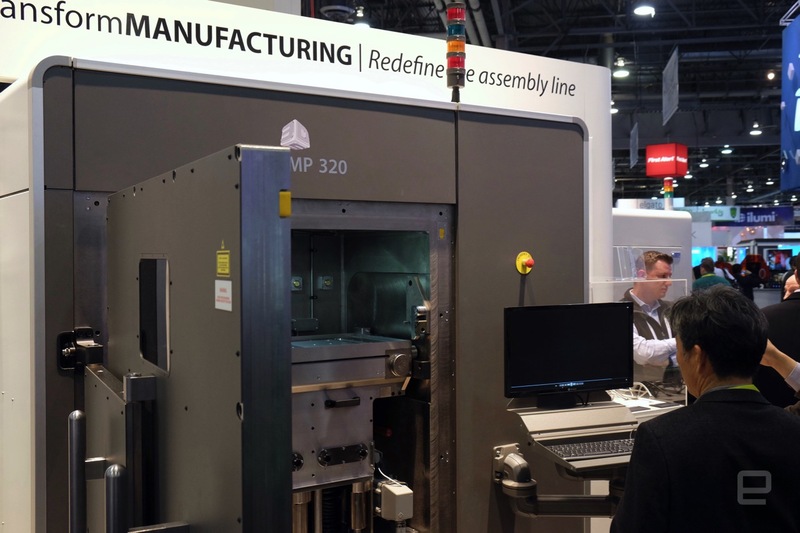 I had a chance to check out the 3D Systems ProX DMP 320 printer on the CES show floor, and it's a massive, impressive and imposing piece of technology itself: The idea of getting it working in space seems like a significant challenge. But some things get easier in zero gravity. When I asked Lewicki what factors go into making sure objects theoretically made in space, using space-mined materials, will handle the rigors of the environment, he noted that some things get a lot easier when you're not on a planet. "This is a part where if you made it in space it would never have to ride on a rocket, it would never experience gravity or any of the high stress and strains that you have to deal with," he said. Ultimately, today's announcement doesn't move us any closer to realizing Lewicki's futuristic ambitions. It's going to be a long time before we're able to manufacture anything in space in a safe and consistent fashion, if it ever happens. But Planetary Resources still has plenty to keep it busy as it works toward its ultimate goals. "People think about asteroid mining and think it's in the far, far future, but this is stuff that we're doing right now," Lewicki said. "We launched a satellite in space last year, have two more on the way this year." The company is also planning to launch an "infrared Earth imager" into space this year that'll supposedly make it easier to scan the planet for resources. It's all very high-minded, ambitious stuff that's just as likely to fail as it is to succeed, but that's just par for the course when you're trying to figure out how to get humanity off Earth and into the reaches of space.